Live Saturday 2pm PT/5pm ET Listen on Outlaw Radio or via radioloyalty.com! 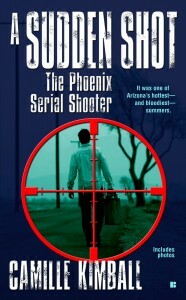 A Sudden Shot: the Phoenix Serial Shooter, her first book, and her second is the Winner of a Reader’s Choice Best True Crime of 2010 Award, What She Always Wanted: A True Story of Marriage, Greed and Murder. Her short crime stories are included in Masters of True Crime:Chilling Stories of Murder and the Macabre, an anthology of true crime writers and their tales. Actually, you can listen via Outlawradio.tv or radioloyalty.com They moved from Itunes to RadioLoyalty. Hi I have been wanting to listen to your show for ages, but as I live in Australia, Queensland I can’t figure out what the correct time is as don’t know what area you are in. I would prefer to listen to podcast but can only find 2010’2011. Can u plz let me know how I can listen and cld there be a problem listening from my ipad2? Next PostDennis Griffin Appears on Crime Time with Vito Colucci, Jr.: Taking Back the Streets with Superheroes!